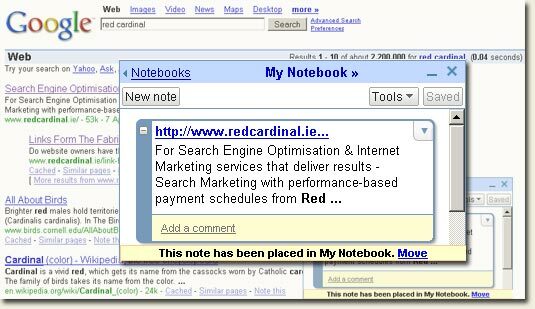 I wonder will Notepad become the latest play in Google’s ranking algorithm? This feature has been in there for a long time, I believe since Google Notebook came out. I love Google Notebook – it helps me to keep things organized while constantly on the move between the office, home and other places. I’ve used the “note this” feature a few times, but not that much – it doesn’t add much value (for me) compared to just copy+pasting the URL + writing a short comment (for bookmarks, I prefer del.icio.us). I can’t see it being a part of the algorithm – it’s too easy to game (if recognized) and the results are too foggy: does noting a URL mean it’s good or bad? That’s curious – I’ve never noticed it before. Just clicked on it to see what it was. The fact that they have a plugin made me think that this might have been something that’s been around for a while. I searched for it but couldn’t find references to the SERP ‘Note This’ feature. Then I saw a thread over on SEOroundtable so decided to pop up some shots. Could play in with Personalised Search as with Bookmarks? I have been using it since last July. I find it very handy if I am browsing around. You never know what you will come across and to be able to note it with out leaving the page (if on FF) is great. Between that and Google’s Bookmarks, I can be on any computer once logged into my Google Account and have everything in one location. I can only think what the next move for Google will be in the online virtual office industry. 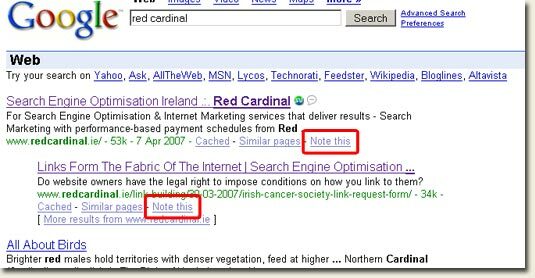 Can anyone confirm if the ‘Note This’ link in the SERPs has been around for long? Again, I’m not quite sure how it would play in with the personalized results – I have over half of my notebook entries about pages I don’t like (and perhaps reasons why, etc). I don’t see it as a replacement for a bookmarking system (though I also have public pages with bookmarks stored there). If anything, I would probably prefer to use URLs mentioned in gmail for personalized search adjustment, but even that is borderline.. So it seems that the addition to the SERPs of a ‘Note This’ link is new then? One thing of interest is the increasing ajaxification of the search results page. We’re starting to see a lot of small iterations by Google that together are changing the way we use search. To me everything seems like an effort to keep us on Google property. The “What are Trends?” section is very interesting! Never turned it on personally. I don’t have a search history (Google I’m sure has it though). I think the jury is still out on personalised search TBH. It’s a nice addition to Google Search but I could never move away from Blinklist myself. “ne thing of interest is the increasing ajaxification of the search results page.” – Have you seen Yahoo’s custom search? Ajax from top to toe. I don’t have a link at the moment. This isn’t it – http://builder.search.yahoo.com – It’s something more Ajaxy. If you’ve created a Google account (which I asume you have as the “Note This” option only appears once you’ve logged in with your account to Google) then all the statistics and searches you have done in the past can do be displayed using the Trends option – and you can add a bookmark from there as well, which is much handier than the Notebook option I think. Yes Richard, I can confirm. This has been available for months now. It’s strange though, I have seen a lot of people only mentioning it now. Perhaps it was only available on SOME accounts? @Cormac – Y! are the ajax kings. Have you ever seen Jack Slocum’s YUI-ext? The guy is a genius. I’ll have to look into it a bit more when I get a chance. Thanks for the comment.